It’s been a couple of weeks since my last visit to Blickling, and this week I went twice, though the first visit was to hear a talk by Assistant Head gardener, Steve Hagon about his 45 years of gardening here…quite a feat. The talk was an amusing wander through some of Steve’s experiences . He began work as a 15 year old straight out of School and at that time- 1972 – the gardens had no powered machinery and no volunteers- quite a contrast to today’s set up! My second visit was on Wednesday as other commitments meant I couldn’t get there for my usual Thursday stint. As before on Wednesdays there was a good turnout. I was sorry to hear the Walled Garden Project Manager, Mike, was still off work having injured his back. If you’re reading this Mike, all the best for a quick return to the gardens! For the first hour I and two fellow volunteers and gardener Jane lifted the Cannas from the double borders and potted these up for transfer to their winter quarters in the orangery. Apparently these didn’t flower very well this year- quite contrast to my own in Old School Garden, which put on their best show to date. Due to the poor (or no) flowering there was a little doubt about the colours of the flowers, so Jane tentatively put general labels in the pots indicating whether from their positioning they were thought to be ‘warm’ or ‘hot’- it will be interesting to see what transpires next year, assuming we have better flowering! After this we joined the bulk of the other volunteers in the Walled Garden where the glorious display of dahlias was sadly no more and the time had come to cut the top growth down and mulch the bed thickly for winter protection. As I’ve mentioned before, Mike has decided to leave the tubers in the ground and use a thick mulch to protect them over winter. I’ll be interested to see how they get on, but given their sheltered position and the thick mulch they should be OK.
We quickly finished off the cutting down- some of the stems were very thick and hollow and many were full of water. Then, while the ladies went over the borders of Thyme and other plants in need of a prune, a few of us turned our attention to barrowing some more of that lovely home-made compost to the border, accompanied by gardener Ed and his amazing tractor skills! Ed managed to not only fill a 3 ton trailer for us which reduced the distance we had to barrow, but subsequently deposited a few tractor shovel loads along the edge of the border. He was also very efficient in doing a ‘formation fill’ of three or four wheelbarrows at once- see the picture below!. Mulch- a layer of natural material spread thickly over the soil cuts down the need for watering, reduces weeding and protects and improves the soil. Mulch matting is also available from most nurseries and garden centres and can be an effective way to conserve moisture and prevent weeds. Bark chippings- attractive, but expensive (unless you have a supply from your own felled timber or know a friendly tree surgeon who will give you a load for free). 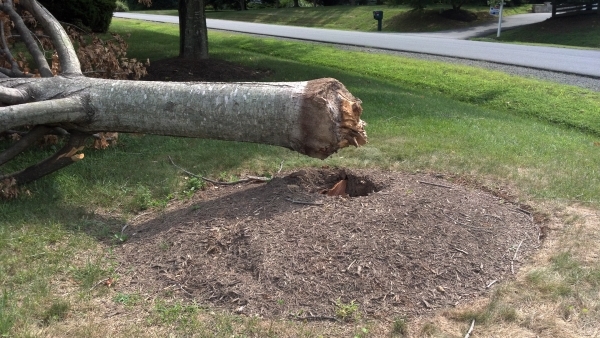 Large chunks will last a long time and don’t blow around, though deep wood chips won’t rot quickly. Use chippings that are at least a year old as the early rotting process will ‘rob’ the soil of nitrogen. Cocoa shells- pricey but has more nutrients than most mulches. They bond together when wet so they won’t blow away. Garden compost, manure and leaf mould- free, but soon rots away. Can spread weeds unless well broken down. Compost and well-rotted manure add goodness to the soil as well as improving and protecting it, leaf mould acts as a protective layer and improves soil texture, but is less nutritious. Grass clippings- free, but turns yellow and can introduce weeds. In wet weather, they can become slimy. Composted bark- attractive, but can blow around and may support wind-borne weed seeds. Does not last as long as chipped bark. Gravel- attractive, and long -lasting, but does not add organic matter to the soil. Various grades available. Oh, and straw can also be used around vegetables and of course strawberries (to conserve moisture and protect ground laying fruit), and if you can get hold of it, shredded paper also works! 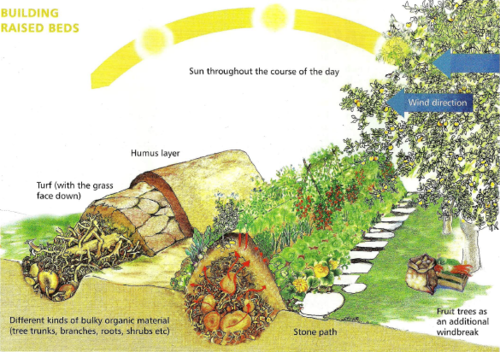 Sheet mulching, No-dig gardens and Hugelkultur have a fair bit in common; basically using organic matter in large quantities to provide a rich growing medium without the need for digging. It depends what school of gardening you’re from as to what your preference is, coupled with your conditions. No dig gardens rely on adding copious layers of organic material over the soil without digging it, allowing the mulch to break down and form a rich top soil, into which vegetables and fruit can be directly planted. You need lots of organic material. Sheet mulching (or ‘lasgane gardening’) has a similar premise to no-dig. 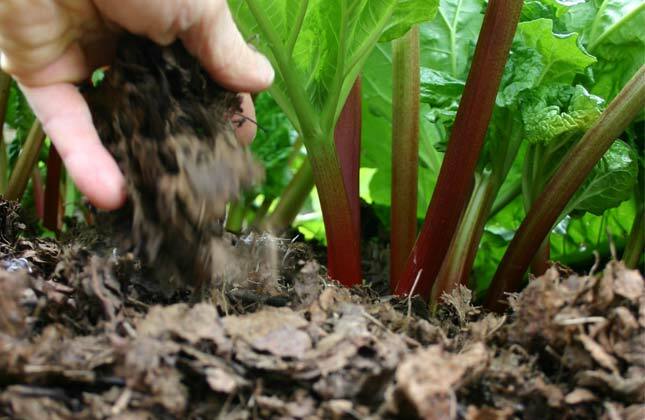 Smother the undesirable plants, mulch heavily, make a ‘lasagne’ of carbon and compost, and plant lots. A good initial burst of energy brings minimal labour further down the line! Hugelkultur (‘hill culture’) are no-dig raised beds with a difference. They hold moisture, build fertility, maximise surface volume and are great spaces for growing fruit, vegetables and herbs. Apply at the right time- mulches need to be in place by mid spring when the soil is at its wettest but is no longer cold. There is no point applying a mulch in dry summer conditions because it will stop moisture from getting to the plants and they will require even more watering than usual. Applying compost or well-rotted manure to fruit bushes and trees in the autumn and early spring will give them a boost, and applying leaf mould to bare soil in Autumn can be an effective protective layer to reduce the leaching away of nutrients in the soil during wet winters. Apply the right thickness- to ensure effective weed control, apply a minimum thickness of loose organic material or gravel of 5cm (ideally 7cm) straight onto the soil surface. 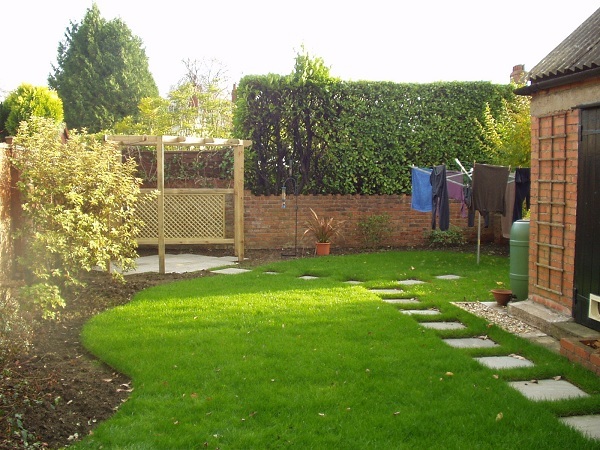 Feed and water plants- add fertiliser before applying a mulch in spring time. Lay a seep hose under mulch matting so that you can supply water easily if needed. 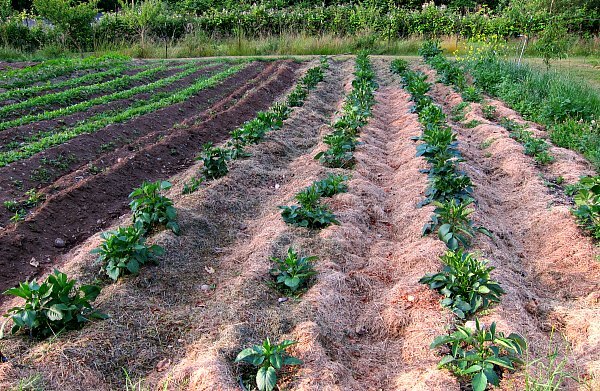 Mulch in rows- when planting vegetables or bedding plants in rows, lays strips of mulch matting along the bed between the plants rather than planting them through the matting. Do avoid disturbing the soil unless necessary. Each disturbance produces a new batch of weed seedlings. Do keep weeds under control by removing weed seedlings and topping up the mulch before the garden springs to life each year. Do choose plants which are self-supporting, particularly if your garden is exposed. Don’t choose short-lived plants that need replacing every few years. Avoid using annuals. Don’t over feed- otherwise plants will become vulnerable to damage. Don’t plant self-seeders near gravel paths or loose-laid paving. Tackle weeds early so they don’t have a chance to flower and then set seed- dig out perennial weeds and hoe out annual weeds on a dry day. Then cover any bare soil with a layer of mulch or ground-covering plants to smother new weeds before they get established. Control problem weeds with a weedkiller containing glyphosate. There is no need to dig at all once you have adopted the raised or deep-bed system for growing vegetables. If you are preparing a vacant plot for planting shrubs or flowers, get rid of the weeds, dig in a thick layer of organic matter and from then on you only need to mulch and let worms improve the soil. Hmm, not sure about this raised bed…. Don’t try to grow a conventional lawn. Instead, create patches of green with a herb lawn using thyme or chamomile. To reduce watering time grow drought tolerant plants, apply a layer of mulch to prevent evaporation from the soil and water only those plants that really need it. Install an automatic watering system, especially where regular watering is needed, such as for container plants and in the greenhouse. Malling Promise canes (and any other summer fruiting raspberries for that matter), planted in February would have benefitted from cutting down in their first season to 100 mm (4 inches) high canes back in March to encourage strong new root development, as well as new canes for fruiting in the following season. In short, Lee, you’ve ‘got a bit ahead of yourself’! I suggest that you cut down all growth next March. You will lose a season’s cropping, but the sacrifice will be worth it in the long run. Giving the canes a good mulch of organic matter or a general fertiliser like fish, blood and bone should also help, if applied next spring. Have you been disappointed with the flavour of your raspberries? Sulphate of potash is a good fertiliser to use to enhance raspberry flavour, but only if the raspberry variety you grow has some natural flavour of it’s own. Varieties like Malling Admiral have little natural flavour, whereas Malling Jewel or Malling Promise are better. Are your raspberries shrivelled up? This might be because you’ve been a little too enthusiastic in digging around the canes! Avoid digging over the ground near the roots, as raspberries are surface rooters and don’t like any cultivation anywhere near the canes. This breaks the roots- which can spread out quite a way- and as a result the plants will be unable to cope with the extra stress at fruiting time. If you restrict your cultivation to the use of a Dutch hoe and follow this up with a good deep mulch of organic matter in the spring this will do wonders for the quality of your fruit. The first autumn raspberries are starting to appear here at Old School Garden (earlier than normal probably due to the mild winter and spring). It looks like we’ll have a good harvest. With these, the fruit comes on canes produced in the current season, so after fruiting (which can last into October) the old canes need to be cut back, but when is the best time to do this? Well not immediately after harvesting, apart from damaged or broken canes. It’s best to leave the rest until the following spring (early March), when all the remaining canes can be cut down almost to ground level. This ensures that some protection for the newly emerging canes is provided over winter. In July weak growth can be removed so that only the strongest canes are left for fruiting. With summer fruiting varieties it’s best to cut down the canes that have fruited immediately after harvesting has finished and to select the strongest new canes and tie these into wire supports to protect them over winter. In spring the tops can be cut back by about 6 inches or alternatively these can be looped over and tied into the top wires.